Yossi Nissan, director of product marketing at Radwin. The concept of a smart city has always been associated with a comprehensive approach to synchronising and organising the many aspects of urban life through the use of information and communication technology. It includes a broad spectrum of interconnected applications such as infrastructure, education, healthcare, transportation, households, social services and others. Making a city smart entails interconnectivity, with the ultimate goal of improving its citizens’ lives, work, leisure and sustainability. These goals are becoming more important as we see that currently about 50% of the world’s population live in urban areas, and this is expected to rise to about six billion by 2045. With these smart city goals, the Internet of Things (IoT), the network of objects that are able to collect and interchange data, is now more important than ever. And the number of IoT devices is growing exponentially. A study by Machina Research in 2016 predicted that a projected number of 20 billion devices will be in use by 2020. Many of these devices connect using Lower Power Wide Area (LPWA) technologies. LPWA can be used in many applications, such as the transportation sector, in traffic congestion sensors, smart parking meters and vehicle fleet communication. Environmental, air and weather sensors, as well as energy and solar panel monitoring. Other applications could include waste management, fire detection and smart lighting. The future IoT landscape in a smart city will rely on LPWA networks, but it will also require higher speed broadband communication for big data transmission. This will be based on a mix of fibre, cellular and wireless to bring connectivity to a myriad of services and devices. 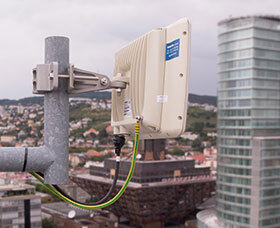 While fibre may have traditionally been seen as the optimal delivery method for broadband connectivity, more and more governments and municipalities are recognising the importance of wireless broadband in the smart city mix; particularly in the mobility sector, but increasingly in ‘fixed wireless’ applications too. Our research and development in fixed, nomadic and semi-nomadic applications mean Radwin has developed a comprehensive array of Broadband Wireless Access (BWA) solutions and deployments in over 170 countries. Radwin’s carrier-class solutions are in use in many of the world’s biggest connectivity projects such as in Moscow Metro, connecting over seven million passengers in transit to the Internet every day, as well as in bus networks in South Africa. When deploying any wireless broadband solution, smart city planners need to take into account the way the technology copes with interference in a dense urban environment. Radwin was one of the first companies to address this with its smart beamforming antenna, making it immune to interference in congested unlicensed spectrums, enabling – for the first time – guaranteed service-level agreements (SLAs) which is vital for use in mission-critical applications.